In their definition of liberation psychology, Montero and Sonn (2009) stressed the need for psychologists to transform both people and environments by rupturing social processes buoyed by social identities. Adding further to the peace implications of Montero and Sonn’s work, Mayengo et al. 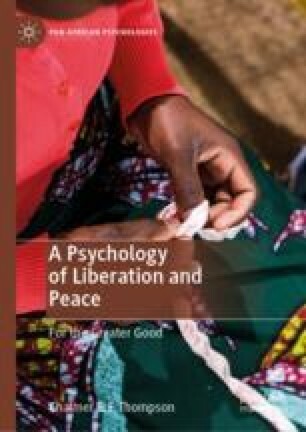 (2018) stated that “practices of liberation yield to peace-building with the understanding that violence in all forms diminishes the capacity for people to live together harmoniously” and therefore, attention to peace is essential to strivings for liberation. Mayengo and his colleagues are a research team that consists primarily of faculty from different ethnic groups in Uganda. Dixon, B. A. (2018, April 12). Deep state restrained Obama: Will it restrain Trump? Time to Abandon mere hope for action. Black Agenda Report. http://www.blackagendareport.com. Espy, J. (2015, October 13). Advancing the anti-racist struggle in the Dominican Republic. Black Agenda Report. http://blackagendareport.com/print/anti-racist_struggle_in_dominican_republic. Fantina, R. (2018, 27 November). How the U.S. creates ‘Sh*thole’ countries. Black Agenda Report. https://blackagendareport.com/how-us-creates-shthole-countries. Kingsley, P. (2018, June 27). Migration to Europe down sharply: So is it still a crisis? New York Times. https://www.nytimes.com/interactive/2018/06/27/world/europe/europe-migrant-crisis-change.html. Maté, A. (2017, October 24). U.S. Military Breeds Violence in Africa. The Real News (TRN). https://therealnews.com/stories/bfletcher1024africa). Murithi, T. (2006, September 25). African approaches to building peace and social solidarity. African Centre for the Constructive Resolution of Disputes (ACCORD). https://www.accord.org.za/ajcr-issues/%EF%BF%BCafrican-approaches-to-building-peace-and-social-solidarity/. Reeves, P. (2018, March 15). Brazilians protest after black human rights activist is murdered. National Public Radio. https://www.npr.org/sections/thetwo-way/2018/03/15/594005158/brazilians-protest-after-black-human-rights-activist-is-murdered. Tabary, Z. (2018, June 18). Climate change a ‘man-made problem with a feminist solution,’ says Robinson. Thomas Reuters Foundation News. Retrieved from http://news.trust.org/item/20180618184812-gcb1a/. The Black Alliance for Peace. (n.d.). The black alliance for peace: A people(s)-centered human rights project against war, repression, and imperialism. Retrieved from https://blackallianceforpeace.com/#home-above-fold. Transcend Media Services (TMS). (2017, March 20). AFRICOM Spearheads Escalation of U.S. Scramble for Africa. Transcend Media Services (TMS). https://www.transcend.org/tms/2017/03/africom-spearheads-escalation-of-us-scramble-for-africa/. Vitali, A., Hunt, K., Thorp V, F. (2018, January 12). Trump referred to Haiti and African nations as “Shithole” countries. National Broadcasting Corporation [NBC] News. https://www.nbcnews.com/politics/white-house/trump-referred-haiti-african-countries-shithole-nations-n836946.